Some time ago, we decided to help some ladies start a small business called Care at Home. This was to provide a service we saw was needed and to create employment opportunities for our ladies who come to Samunnat seeking their rights. We researched and know that women are vulnerable to many problems because they do not have independent income. We are always thinking about sustainable ideas for jobs and we saw that there was a need for people to take care of the senior parents in a family because so many young people are working overseas. We saw there was a need by senior citizens left behind by their children. [Ironically, many young Nepali people working overseas are taking care of our older people in those countries!] We did some planning and training in first aid and health matters and gave people the information about our service. We visited several senior citizens’ homes including one near a pilgrimage site near a river bank in our district. Senior people think it will be an advantage to them spiritually to die near these holy places. I could not bear to sit there for more than half an hour because of all the mosquitoes! Their accommodation was so dark and suffocating with no fresh air circulating. When we visited, the people thought that we were doctors and started to tell us about their illnesses. There were 60 male and female senior citizens. They had many problems with eyesight, diabetes and gastritis, kidneys etc. We are not doctors but we could share with them some basic information about using antibiotics appropriately [a huge problem in Nepal! ], eating good healthy food and taking some regular small walks. The major problem was with eyesight so we are talking with our local eye hospital to see if they will bring them some eye treatment. We are also hoping to arrange spraying for mosquitoes. Thinking about how to solve some of our problems has opened our eyes to another group in our community with problems. Maybe we can help each other. 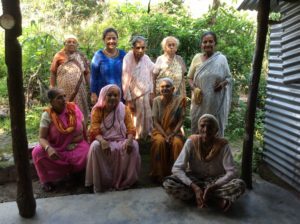 How wonderful for these seniors in need to have found caring friends in Samunnat. you continue this new project and also explore ways of helping another needy group in your community. Frances Boland.